Experience what the ancient city of Luxor has to offer with our stunning Luxor day trip from El Gouna, enjoy a new stage of your Egypt vacation in El Gouna and try to explore the ancient Egyptian civilization with an expert Egyptologist tour guide who will accompany you to visit the breathtaking Valley of the Kings, the amazing Karnak temple, Queen Hatshepsut temple, and the two statues King Amenhotep III of Colossi of Memnon, then we will drive you back to your hotel in El Gouna. Book Now!!! Boat ride in the Nile river. The final resting place of Egypt’s rulers from the 18 the h to the 20th dynasty, it is home to tombs including the great Pharaoh Ramses II and boy Pharaoh Tutankhamen. The tombs were well stocked with all the material goods a ruler might need in the next world. Most of the decoration inside the tombs still well preserved. Finally, we will drive you back by a private air-conditioned vehicle to your hotel to end your Luxor day trip from El Gouna. My friend and myself took a day trip to Luxor. It was a wonderful experience, well organised and informative. Our tour guide Marian Azer was super. Well informed, very caring and helpful. We recommend highly both Egypt Portal Day trips and Marian! Once again we have booked our trip with Mrs Ahmed Ramashka. This time we choosed luxor trip. And we had one of tye most amazing experience. To be honest all your trips is very nice over the top. And thanks for unforgettable experience. I had a good time in the Luxor day tour. Ayman Abdou was very informative and knowledgeable of the history of the kings. The people of Luxor were very friendly and felt safe. We were able to explore most of Luxor in that day. Everything as described on their web site. Booked this trip on our sons recommendation and we were not disappointed. Our guide and Egyptologist Omar Khalifa was superb. He has a vast knowledge of Egyptian history and gave us a potted history of Egypt before setting out on our exploration of the tombs in the Valley of the Kings, ” 7 thousand years in 7 minutes” as he put it! Door to door service with a one to one expert, would gladly do this trip again. We were picked up at the hotel in a private car at 05.00hrs and driven 3.5 hours to Luxor where we collected our personal Egyptology expert, who spent the day with us. After this we went to Luxor for a traditional Egyptian lunch on the terrace of nice restaurant overlooking the Nile. Then our guide took us on a private boat trip along the Nile, sailing gently passed the Winter Palace, whilst watching the children swim in the Nile. I booked this private trip for me and 9 friends before arriving in Egypt. We were picked up from our hotel in El Gouna where we traveled to Luxor. We all agreed this was such great value and so well organised by the company. We visited 5 sites had a boat trip down the Nile which was such a relaxing break to have some tea during the midday heat. We were provided with an authentic north African Lunch. This was delicious! We were all so pleased and had such an enjoyable experience. Our tour guide Wael was incredibly informative , warm & friendly. 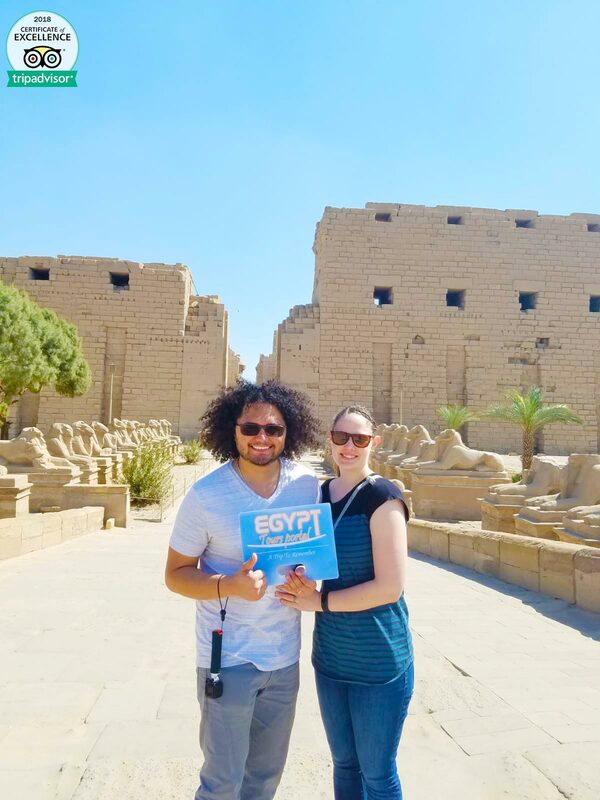 I’m so happy to have seen Karnak temple , the tombs and sites within the Valley of the Kings, but Wael our tour guide was awesome and really made it amazing, he provided us with a welcoming insight into the fascinating culture of ancient Egypt. He was very passionate and his great jokes and banter seen us through the hot Luxor sun that us Brits were struggling with at times! I’d like to express my gratitude to Egypt tours for their wonderful hospitality . It really made our visit to Egypt unforgettable ( as promised)with memories we will keep for a long time. I would definitely recommend this tour to any one travelling to Egypt, it’s some effort to do such a long day trip but ultimately worth it!